The 1970s vintage commercial opened on a woman who had reached her stress limit. As the mother to four children, Margie Raffield found that the only breaks she got were in the bathroom and, even then, she might be interrupted. “The time I spent in the evening in the tub was my only time alone,” she recalled. And Calgon notwithstanding, she preferred handmade bath products — whenever she could find them — to a chemical bath. Never had she forgotten her childhood experience of learning, at her grandmother Lorene Roberson’s house in Leeds, Alabama, how to make soap — a pursuit that she and “Nanny” enjoyed when not shelling peas on the porch. She learned that there is a lot of heart and a lot of work that goes into items made by hand. Raffield’s youngest son, Spencer, was a senior in high school when she picked back up a book on soapmaking she had purchased years earlier. She had tried making soap in her kitchen one time when her children were small, but she was uncomfortable working with lye in a small space with kids and dogs about. Then, three years ago, she and her husband, Eugene, built a new home in Port St. Joe that included a heated and cooled outbuilding off the carport. Eugene planned to make it his man cave. Instead, Raffield began experimenting with soapmaking in that little building. In February 2017, she made her first batch including a half-dozen personal recipes. When at last the bars were cured, she shared them with friends and family members and enjoyed feedback so positive that she became convinced she could make a go of it with a soap business. Add natural oils (Raffield favors olive oil, coconut oil and shea butter). Add fragrance oils or essential oils. When the mixture reaches “trace,” the point at which the oils and lye solution have emulsified, pour it into 2-pound loaf pans. Cover the loaves with cling wrap and towels and let them cool for a day or two. Put bars on racks and let cure for about 40 days. Slowly at first, the business, St. Joe Soaps & Essentials, gained traction. Prohibited by city ordinances from operating a retail operation at her home, Raffield wholesaled her products first to the Anchored South boutique on Reid Avenue in Port St. Joe and then added more local shops and a few out of town. Her husband became her production advisor and efficiency expert. When she grew frustrated trying to make bath bombs — her mixture would dry out before she could mold it into balls — Eugene bought her something she didn’t know existed: a bath bomb press. 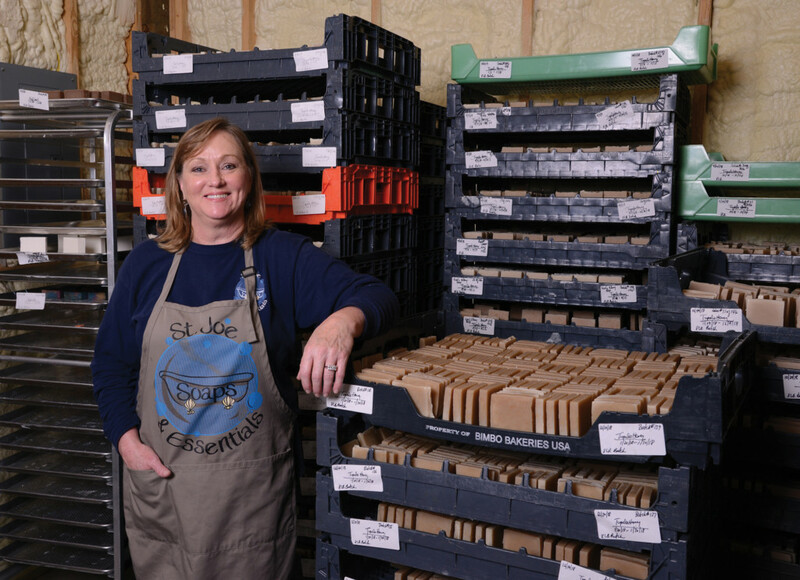 Owing to a connection supplied by Eugene, who is a vice president at Raffield Fisheries, Margie shipped a pallet of soap from Port Panama City to Progreso, Mexico. And the woman who built her website (stjoesoaps.com) led her to God’s Glory Box, a business that sends faith-based and other items on a monthly basis to subscribers. The March 2019 mailing of 10,500 boxes will include half-bars of soap produced by Raffield. That giant order has been so consuming — Raffield has just two part-time employees at this writing — that she has had to postpone plans to expand her product line that already includes Epsom salt cakes, sugar scrubs and lotions to include a dog shampoo and other products. Still, the business has outgrown Man Cave I and has now overtaken a pole barn that Eugene had built recently intending that it serve as, well, his man cave. Raffield said that her products are unlike high-volume commercial products because she uses natural ingredients. Her oils are food grade. Lye is the only harmful agent used, and it evaporates from the product. Commercial producers take the moisturizing glycerin out of soap and use it in the manufacturing of cosmetics. Raffield leaves it in so that her soaps do not have the effect of drying skin. Users of St. Joe soaps report that they prevent cracked heels, make toe fungus go away and, in the case of Tupelo Honey soap, soothe burns and cuts. Today, Raffield finds herself at a crossroads. She can stand pat and continue to make bath products at her current pace. Or, knowing that her business has great growth potential, she can take it to a new level by investing in employees, equipment and a delivery truck and by continuing to overtake man caves. You may be curious to know whether Eugene reclaimed Man Cave I. “It’s now my inventory shop,” Margie Raffield said.